Since 1951, Valcor Engineering has designed and manufactured fluid control valves and related components for some of the most demanding applications. When you work with Valcor Engineering, you tap into the power of a reliable, proven organization geared to support you at every turn. It all begins with our engineering and manufacturing team. Our world-class staff of engineers, designers, and technical support personnel utilize fully-equipped modern test facilities to test the most precise and exacting standards. 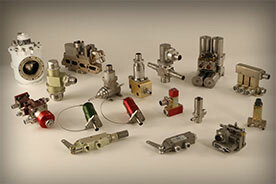 Valcor Engineering specializes in solenoid driven fluid control devices. Valcor Engineering’s in house manufacturing capabilities range from machining the most complex parts in our CNC machining and turning centers to our fully automated welding and composite winding machines. With a library of more than 18,000 designs, the Valcor Engineering design team can modify existing technology to suit practically every hard to handle application. We specialize in custom applications and will create an entirely new product to meet your most demanding application. Last week, Valcor had the pleasure of attending NJIT’s Career Development Services Recruiting Partner Awards! Valcor has always taken pride in supplying our customers with the best quality and best value components. Below is just a small sampling of the top-notch companies that we work with.